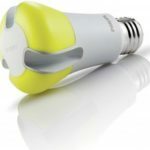 The bulb triumphed in the Bright Tomorrow competition run by the US Department of Energy (DoE) that aimed to find an energy efficient alternative to the 60-watt incandescent light bulb. The DoE challenged firms to develop a design that gave out a warm light similar to that from an incandescent bulbs but was much more energy efficient. Philips was the only entrant for the competition and its design underwent 18 months of testing before being declared a winner. LED bulbs face competition from compact fluorescent lights which are almost as energy efficient and cost a lot less. 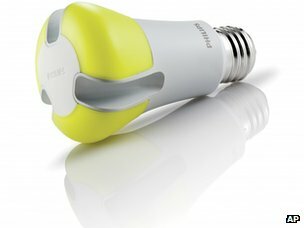 Philips LED bulb LED bulbs should last about 100,000 hours, giving them a life of about 20 years. Production of 100 watt bulbs has ceased in the US and Europe. Production of 60 watt bulbs has been stopped in Europe and is being phased out in the US. From 2014, incandescent bulbs of 40 watts or above will be banned in the US. Sales of more energy efficient bulbs are being aided by official moves to end production of higher wattage incandescent bulbs.